Emma Putnam is dead, and it's all Sara Wharton's fault. At least, that's what everyone seems to think. Sara, along with her best friend and three other classmates, has been criminally charged for the bullying and harassment that led to Emma's shocking suicide. Now Sara is the one who's ostracized, already guilty according to her peers, the community, and the media. During the summer before her senior year, in between meetings with lawyers and a court-recommended therapist, Sara is forced to reflect on the events that brought her to this moment—and ultimately consider her role in an undeniable tragedy. And she'll have to find a way to move forward, even when it feels like her own life is over. In this powerful debut novel inspired by real-life events, Amanda Maciel weaves a narrative of high school life as complex and heartbreaking as it is familiar: a story of everyday jealousies and resentments, misunderstandings and desires. 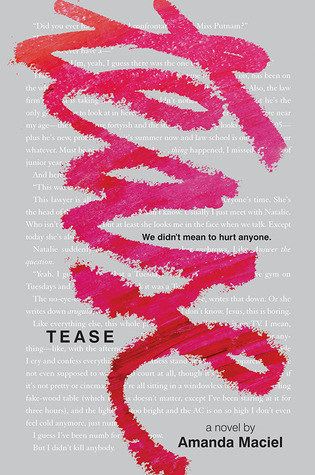 Tease is a thought-provoking must-read that will haunt readers long after the last page. The cover of this book is really eye catching. It's super shiny (EpicReads showed it on one of their TeaTime) and the color red looks like from a lipstick. This book sounds like a heartbreaking story so I can't wait to see how it goes. So what are you guys waiting on this week? I've heard some eh things about this and I'm not sure if it's for me, but I LOVE the cover. That sounds like a powerful story. yeah the story sounds so good but now I just hear it's kind of eh so I don't know. Sounds intense! Also such a relevant problem today dealing with bullying and suicide. So glad authors are addressing real life issues.